You don’t have to be able to see to crochet. You can feel your way through the work. 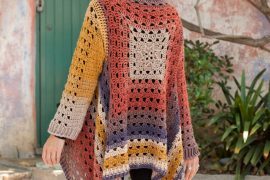 In fact, many people who crochet are blind – either because they were born that way or because they experience macular degeneration over time. 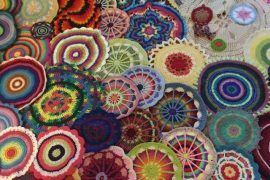 Many older people with limited eyesight can no longer drive or do other daily things but they can still crochet. Here are some of those inspiring crochet stories about blind crocheters. 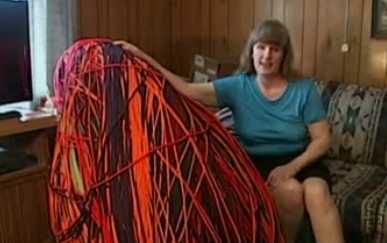 I wrote about Patricia Belcher, legally blind since birth, back in 2012 when she was aspiring to break a crochet world record for the World’s Longest Crochet Chain. To my knowledge she has not yet broken this record. 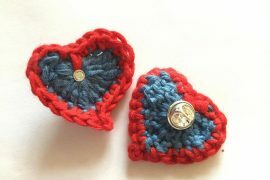 Terry shared her story with us previously about crocheting to heal through the depression and fear of unemployment. 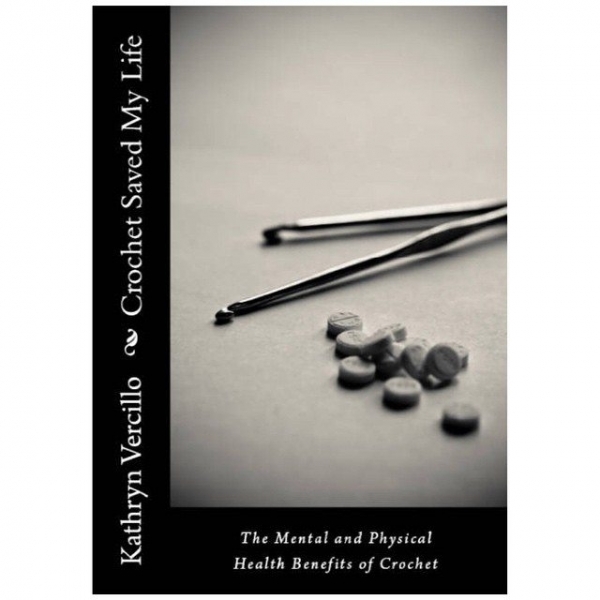 She had read Em’s story in my book, Crochet Saved My Life, and it had resonated for her. She mentioned in passing as she shared her story that she is legally blind. Another story that’s also in Crochet Saved My Life is from Liza who crocheted to cope with temporary blindness. Beverly Lewis was blind when she learned to crochet. Someone at church held her hands and showed her the basic stitches. She crocheted a blanket for her pastor, which took almost a year to do, but then went on to crochet presents for all fifteen of her siblings! Talking Crochet shared that fashion designer Stephanie Dunn was “born with macular degeneration, a progressive eye disease, as well as high myopia, but (also had) an injury so damaged an optic nerve that she sees only light and shadows with her right eye.” She creates knit fashions with crochet trims and details. 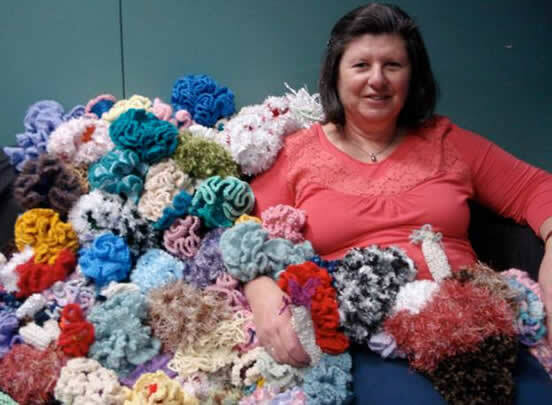 Gina Pontelandolfo is one of the contributors to the crochet coral reef project in Melbourne. She has a rare genetic condition “and since the age of 25 has been slowly going blind as her vision has narrowed into an ever narrower tunnel”. Kay Foster started slowly going blind about fifteen years ago and that was when she decided to learn how to crochet. 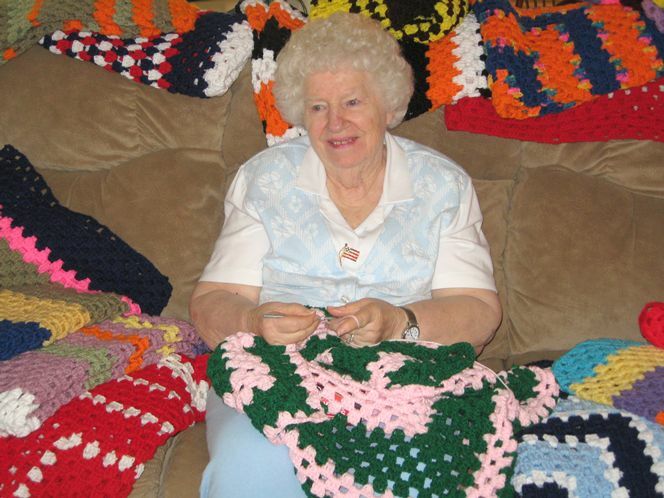 She crafts blankets for charity, and she says it relaxes her to know she’s helping someone else this way. 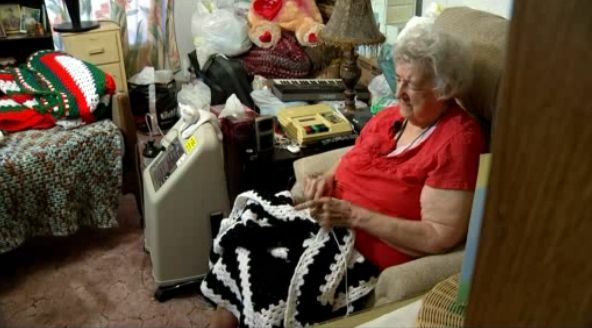 She crochets 3-4 hours per day and has donated about 250 blankets. Jeanne Gallegos has a similar story. 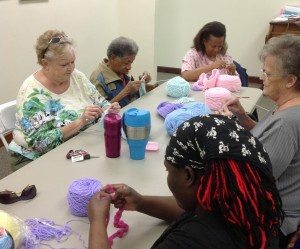 Anna Murphy, slowly going blind from macular degeneration, reduces the anxiety that causes her by crocheting half a dozen blankets per month for charity. Similarly, Bea White crochets lap robes for cancer patients and Eva Lilly crochets prayer shawls for cancer patients. Terra Taylor is a young grandmother of three who also crochets for charity and also has macular degeneration (although she actually first lost her vision in one eye due to a freak accident).